A flimsy microphone frustrated Bill Belichick at Sunday's postgame press conference, edging the Patriots coach out for a 1-0 win. 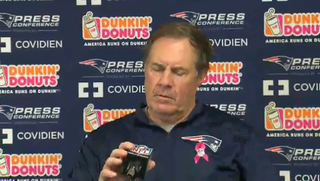 Belichick struggled with the microphone's poor setup, and called it a "stupid thing." The microphone capitalized on his emotions until the Patriots coach ultimately let it rest on the podium instead of the stand. Belichick's inability to beat technology is concerning but not surprising. He had previously lost to a car clock, 1-0.